(1) Don't forget about using our Books pages to review / purchase Pathology related books. Also, please click on one of our Amazon.com links before making ANY Amazon purchase, because Amazon will give us a commission from your purchases, at no cost to you, which helps maintain our website. (2) We posted a new article on our Management Page: Ten Ways to Improve Your Requisitions, by Leigh Polk, McKesson Revenue Management Solutions. (3) We have reconfigured the Home Page search box, so it should now work with Internet Explorer, although we recommend using Firefox, Safari or Chrome as a browser. (4) We are proud of our record traffic of 21,475 visits on October 9, and over 19,000 visits on every Monday through Thursday in October (to date). Thanks for your support. (5) We are experimenting with additional advertisements that will help us improve our free online textbook. We do NOT plan to have popup or other obnoxious ads, or to damage the functionality of the website. Let Dr. Pernick know if you have any concerns at NatPernick@hotmail.com. 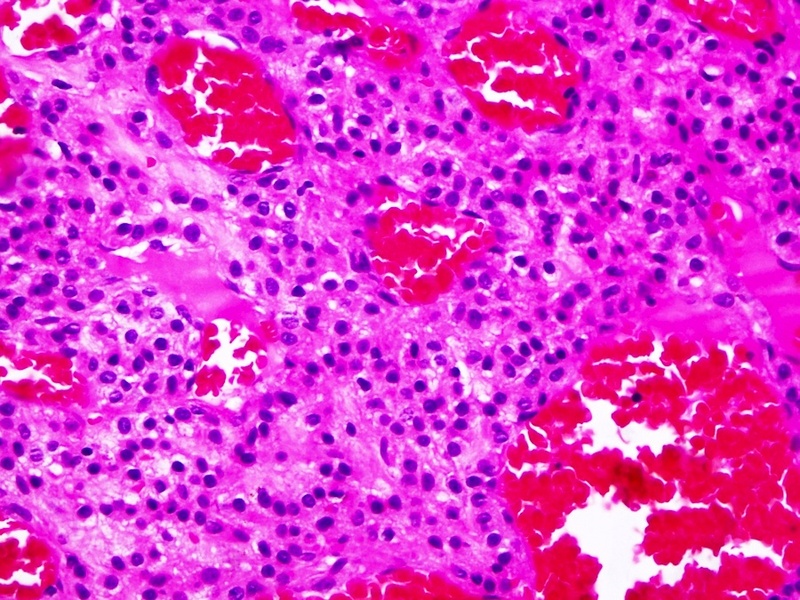 A 42 year old man presented with a painful nodular forearm mass. 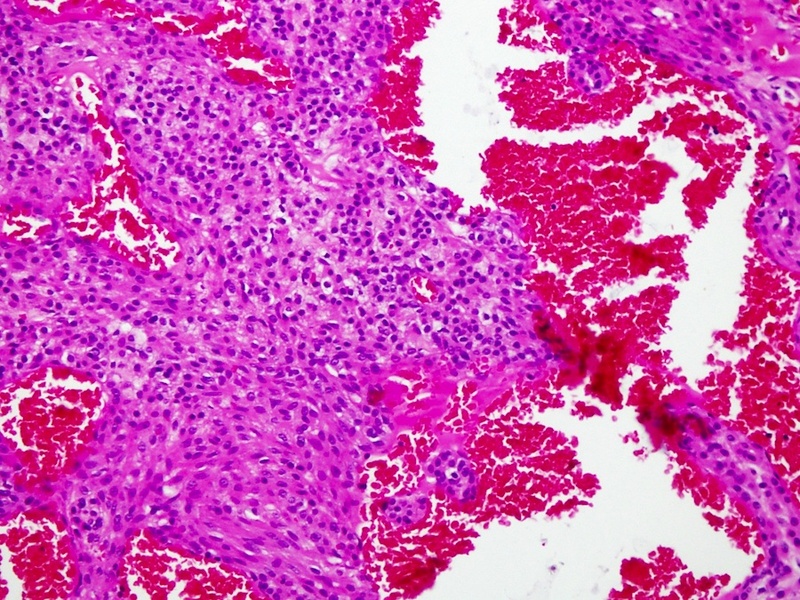 Glomangiomas are a type of glomus tumor that resembles a capillary hemangioma. They occur in a wide age range, and are exquisitely painful due to abundant nerve fibers. 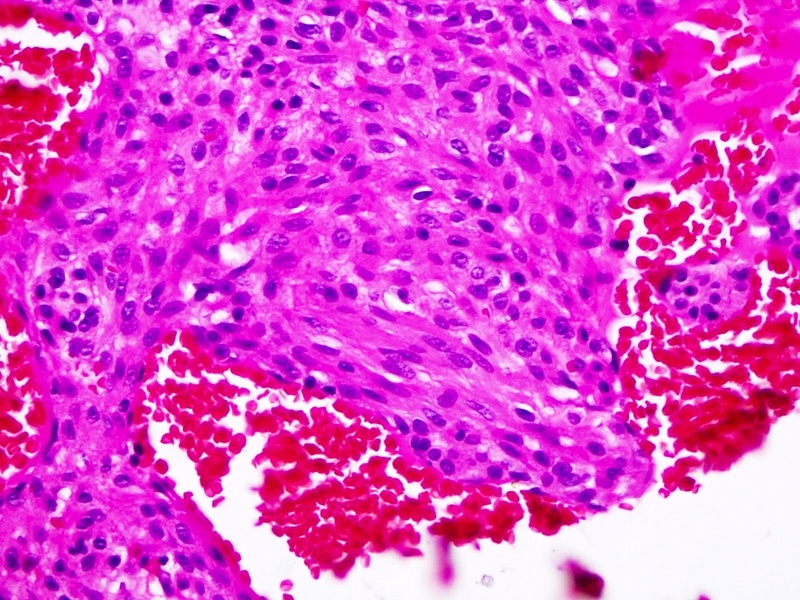 Glomus tumors arise from modified smooth muscle cells of the glomus body, a specialized arteriovenous anastomosis involved in thermoregulation. They are usually found under fingernails, but also in the skin, flexor arm/knee and GI tract. 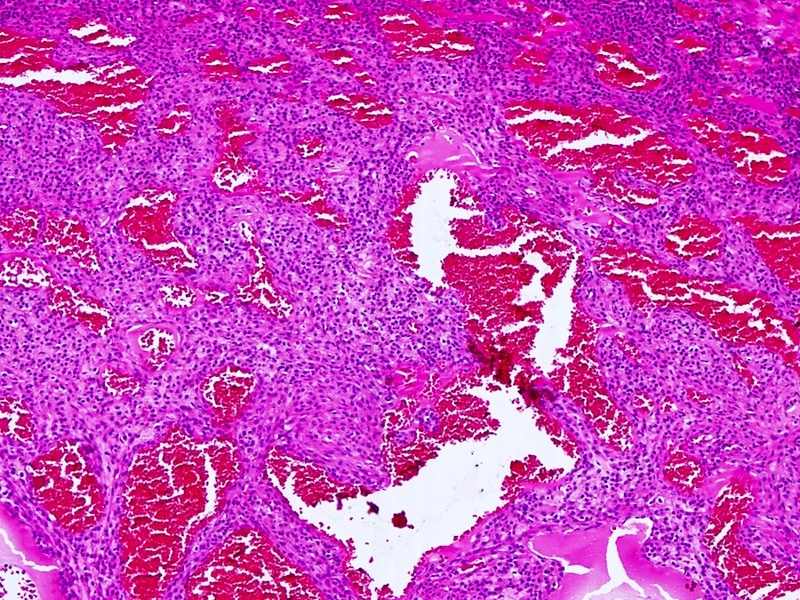 Histologically, glomus tumors have nests or aggregates of glomus cells arranged around vessels. The glomus cells are distinctively homogeneous, with bland nuclei and small, regular and indistinct nucleoli. There is no / minimal atypia or mitotic activity. All glomus tumors should have at least focal areas of typical glomus tumor, usually at the periphery (Am J Surg Pathol 2001;25:1). 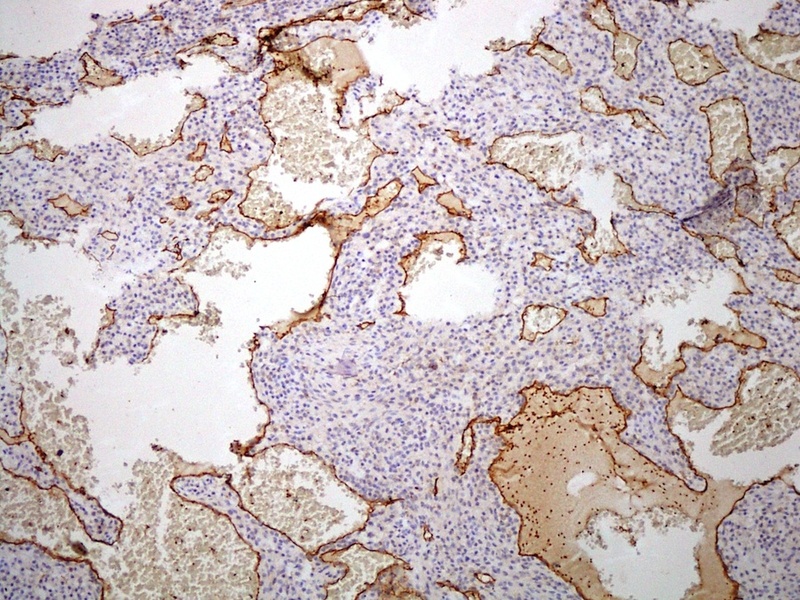 Glomus tumors are immunoreactive for smooth muscle actin (as in this case), type 4 collagen and vimentin. There is variable expression of CD34, h-caldesmon and calponin, and no expression of keratin, desmin, S100 and chromogranin. 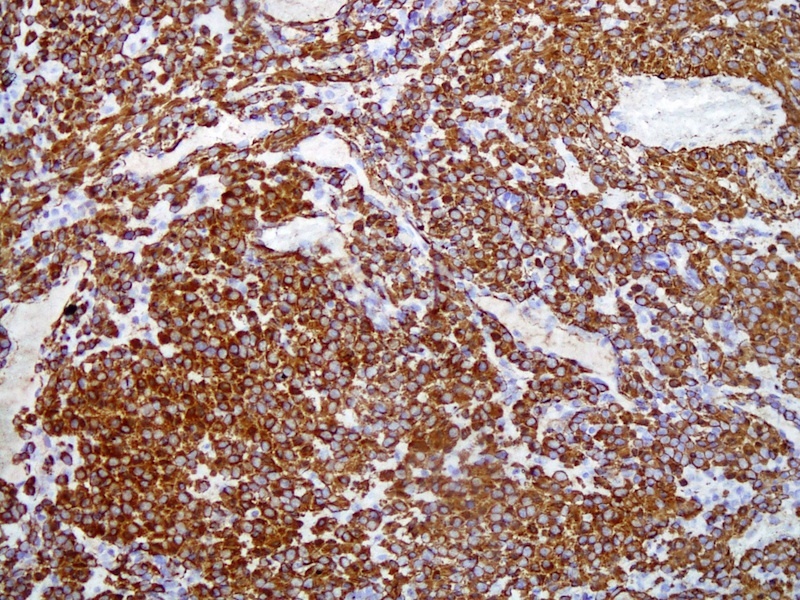 CD31 highlights the vasculature, but tumor cells are CD31-. 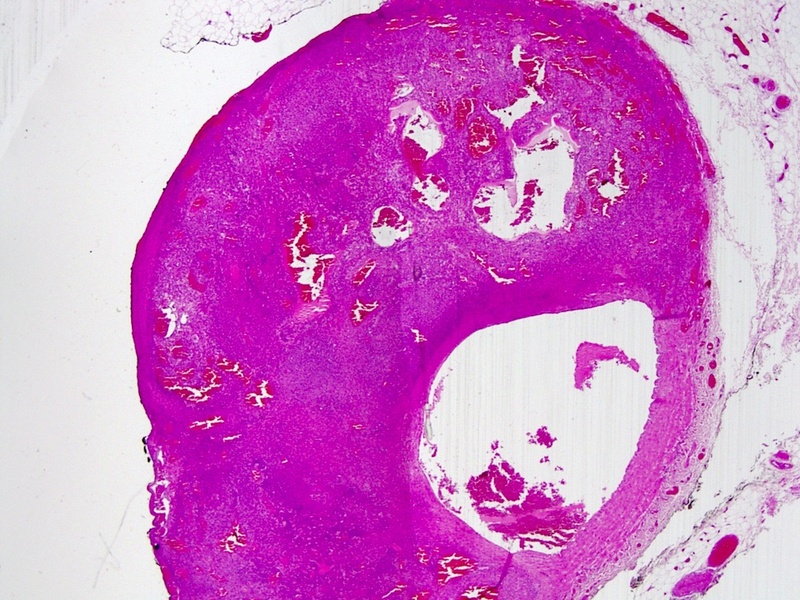 The differential diagnosis of glomangioma includes capillary hemangioma, which lacks the alpha smooth muscle actin+ cells seen in this case. Eccrine spiradenoma is often painful, but is not arranged around vessels, has two cell types, and is also CEA+ (Br J Dermatol 1984;111:175). Glomus tumors with 5+ mitotic figures/50 HPF, atypical mitotic figures, large size (2 cm+), or location deep to the muscular fascia may be designated as glomangiosarcoma, with possible metastatic behavior (Appl Immunohistochem Mol Morphol 2009;17:264). Glomus tumors without atypia and without mitotic activity typically have a benign clinical course, and excision is curative.